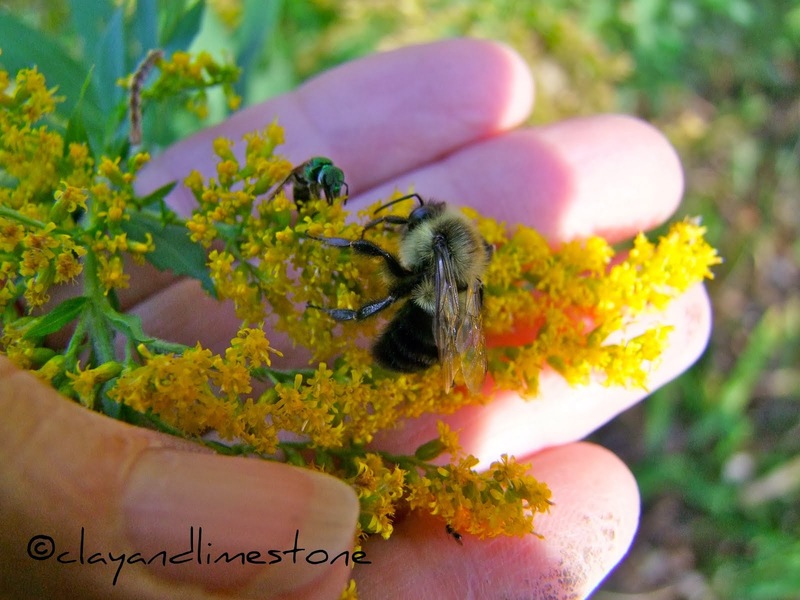 When I planted the kales and cabbages this past September, the trees were barely beginning to turn the golds and yellows that are autumn at Clay and Limestone. Autumn is lovely, but, it gives way to months of winter when there is more brown than white covering the ground. More color is needed in the garden. I plant cabbages, kales and mustards for immediate impact and with an eye to the future~The serrated and fringed leaves of flowering cabbages grab attention and keep it all winter long. The feather leaves of kale shimmer with diamond raindrops in our wet winters. 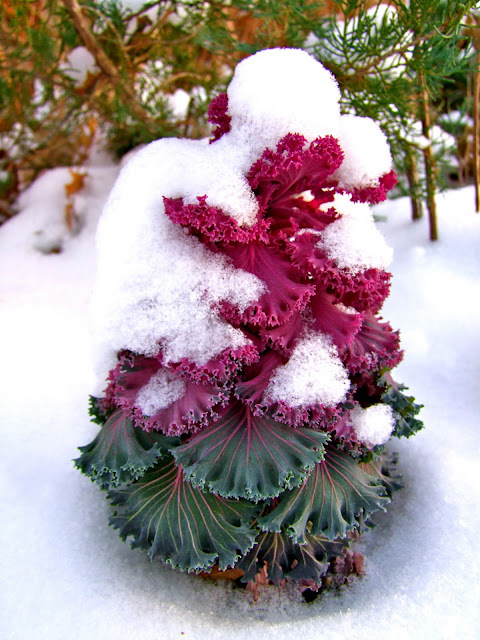 fringed leaf kale dancing in the snow! Mild winters with only occasional snow means we need cabbages for long term daily garden duty. Many cabbages and kales have been planted in beds and containers. Tulips, daffodils, violas and wallflowers have been planted with them. 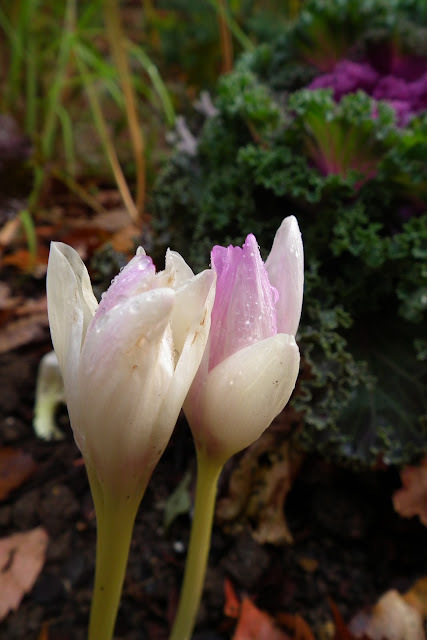 Early in October, the kales and mustards hosted the colchicums that were planted at their feet. All the kales and cabbages will survive what ever winter throws at them (they are hardy to -10*). Oh how wonderful, dear Gail. Those splashes of color from the kales are just what a brown and grey garden needs for a pick me up, gardeners too! I love the flowering phase, and thinking about iris and tulips will help get us through what is to come before then. lovely Cabbages, I keep meaning to plant them for the winter and then every year I forget! They will wonder why there was such an increase in flowering cabbage and kale purchases next fall... it all started right here! Very nice Gail. They are truly like flowers in the garden giving a pop of color. I love the flowers too. All good things come to those that wait. H.
Who doesn't love those jewel tone colors of the cabbage and kale and it is a welcome foil to the gold and browns of autumn. I'll bet many never get to see that tender yellow of the flowers. I may just have to plants some next fall for the spring show. 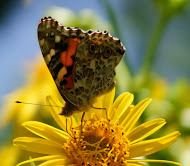 Your colorful photos are such a pick-me-up on this gray and lazy day, Gail! I had no idea the kale and cabbage might last through the winter and bloom in the spring. I still have some kale in the vegetable garden, so I will definitely let it go and see what might happen come spring. Set against the blue iris and the pink tulips, those yellow blooms do look appealing! The kales and cabbages look great. I haven't had any luck getting them started. I'll just enjoy yours. The cabbages and kales are just the right thing to brighten up the winter landscape at C&L! That pale yellow does look lovely with blue Iris! What beautiful photographs of those kales and cabbages - and northern oats. This morning our landscape has a limited palette - whites and browns. I love kale & cabbages. I've never left them to flower, and last fall I failed to get any ornamental ones. I have 2 edible cabbages in containers still. It'll be interesting to see what happens with them in the spring. Sound advice I heed every autumn. I am not as big of a fan of the cabbages as much as the kale, especially Red Bor kale. My favorite from this family is the giant red mustard which I pair with pansies. Who knows what they look like now with 14" of snow on top of them. Every time I see kale in blog posts I want it more and more! I have got to add some next year!! Sadly, here in the frigid north, ornamental cabbages don't flower -- they collapse into smelly, rotting mush... I'll just have to enjoy yours! Gail, I love the skirts of your lively dancing kale - they are delightful! Cabbages are treated as annuals here so I had no idea they flowered! how pretty. I particularly like the photo of the tall kale full of snow. I hadn't thought much about cabbages or kale, but before your blog I'd only seen them clumped together in parking medians in front of stores. They are beautiful in your garden. Your cabbages & kale's are wonderful. I love the colors of them. I've always wanted to grow these but have not had any luck with them. Must keep trying. I have never seen the Kales flower here in Western New York. They succumb before that here, most likely the wet soils before the cold temps. They do have pretty flowers though. I do like your snow covered Kale. I love the various cabbages and kales, their colors are so bold and bright. Good for you to plant them. Wow, Gail, I forgot about these colorful cabbages. I wish I had some room to plant them. So cool! Hi Gail, Happy New Year and more blessings for you! Your title is so apt for the photos. I really love that kale standing galantly in the cold, how beautiful it looks like. We dont have them in the tropics though! Looking at these photos makes me want a whole garden full of cabbages, kale, and river oats seed heads. Lovely, as usual! Okay Gail. You're making me think again!! I swear cabbages die here over the winter???? Could it be they don't and I've been pulling them out when I shouldn't?? I would love to see them blooming ~ I've never had that happen. They sure look happy at C&L. Hope the snow is melting and you are staying warm? Happy New Year!! Never knew that cabages and kales can be soo beautiful and add colour to an icy garden! I always overlook the ornamental aspect of cabbages and kales. Although the mustards do bring a lot of bloom to the gardens in spring. Such a beautiful splash of color in your gardens for so late in the year. Happy New Year Gail! Wonderful photos! I agree -- every garden should have lots of cabbages and kales in the winter! I love kales and cabbages, whether ornamental or not. This winter is proving to be trying even for hardy ones (at least in the mountains), but normally they're wonderful to have! Gail, your cabbages and kales are so colorful and bright in your gardens - like others mentioned before me I never knew they flowered the next spring. It's nice to see your beautiful pictures to remind us that spring is only a few months away. I think you should turn that image of a snowy red and green kale leaf into next year's Christmas card. Looks so much like a gardener's christmas tree!